* FEATURED IN 8TV HOCHAK! How do you define authentic food from a particular stall or restaurant? For anything that come with “Penang DISH NAME”. I will first approach them and speak Penang Hokkien directly. For Sarawakian food, I guess you should go with the Kuching local Hakka slang. I previously really curious to try the local food taste of Sarawakian foods. All I got is just Kolo mee in Taman Megah at first. Now we got a restaurant that focus in authentic Sarawak foods. The shop is called Kafe Rajah Brooke. Just by the name alone already tells you it is Sarawak related. Those that never study about Malaysian history probably won’t know about this. Kafe Rajah Brooke is run by 100% Sarawak people. It was established by husband and wife (Kenneth and Yvonne) who love Sarawakian foods a lot. They just have a simple goal which is to share the good food to the public or some of the Sarawak people who reside in Klang Valley. This is in Kuchai Lama. Taman Megah one is just right opposite of Ming Tien food court. Only available for lunch. great to see authentic food from sarawak being served in a clean lined shop with air con 🙂 gotta visit this place! Indeed convenient, Sarawak food available right in Klang Valley. More people will get to taste the food. oh, near to Nippy? then i get a rough idea on this location. Rajah Brooke … not a name of the species of butterfly meh?! hmm, thought that’s James Brooke. whatever. Rajah Brooke is the name where locals gave him. Real name is James Brooke. From Rajah Brooke, go until the end is Nippy Noodle already. what a shame…as a Malaysian, i haven’t visited sarawak b4…so no idea howz the food taste like….but seeing yr post, i guess it should be good ya! Sarawak famous for Pepper! Anything with their home grown pepper is good! The padungan rce is my fav too for tht nite! gill gills last blog post..Left-overs:Bacon chips+sea cucumber+ABC soup=EXPERIMENT! KL also hard to find. isnt Rajah Brooke a butterfly? not colonial food ar? wow.. nice set up. love the deco and larger than life pic! This can consider Sarawak street foods. yea!! padungan rice for me too!! LOL =D hehehe.. not a bad place to makan la aye?? 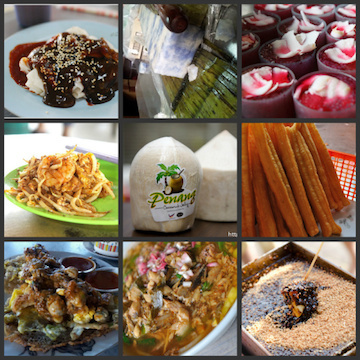 omigoodness, i love all these sarawak food, esp mee kolo. say, do you know where to buy sarawak laksa paste in KL? You can try order from this restaurant. See whether they sell ? If you like pepper, you sure love all their foods. I think that is part of their set lunch. Yea … it is very special in taste. Just tried the food at Rajah Brooke, I went for the Sarawak Laksa and Kolo Mee. I’m a Sarawakian, from Kuching to be more specific, and its always nice to discover places that serve food that reminds me of home. The environment was nice, location was not too difficult to find (from Sunway), and though the pricing is kind of on the high-side, its well worth it. The laksa was ok, Taman Megah’s one is better in my opinion :), it reminded me of my high school canteen’s laksa (SMB St. Joseph, Kuching), and the Kolo mee was nice…but missing the red pork-oil usually available in Kuching, taste was nice. wei ken, i went the other day for lunch, and guess what? they say their mains already FINISHED! that was about 3pm. asked us return in the evening. ahem … ended up eating something else. .-= j2kfm´s last blog ..Cafe Takahashi @ Jusco Kinta City, Ipoh =-. RM3 promotion on all stall food and 50% discount on drinks – try the Teh C Peng Special. From 31st Dec 2010 until 31st Jan 2011.